Let the beauty of the Amish Baldwin Dining Room Table create the centerpiece for your dining room decor. 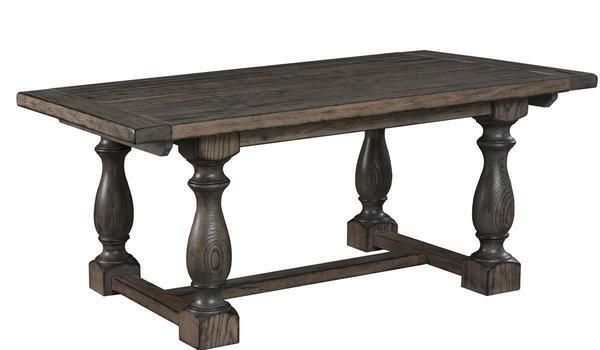 This grand dining table captures the quality of Amish craftsmanship within its stunning design. A 2" thick edge displays the beauty of the solid wood you select to create your dining table. The Baldwin offers rich breadboard ends offering a look at an authentic solid wood product as well as the warmth of the solid wood. The Baldwin provides a dining table the family will love using for gatherings throughout the years. This Amish dining table captures all the style and function needed to serve your dining room for generations. Customize the Baldwin with the dimensions that serve you best as well as solid wood extensions to accommodate more guests on special occasions. Learn more about dining table styles on our helpful blog, "Timber to Table." Take a look at our collection of Dining Room Chairs to find the ones you like best. All of our dining room tables are Amish made in America by masters of the craft. Call us today, toll-free at 866-272-6773 with any questions or visit our DutchCrafters Furniture Store in Sarasota, Florida to experience Amish furniture in person.